Power supply for the circuit should be 12 volt Transformer power supply or Capacitor power supply. 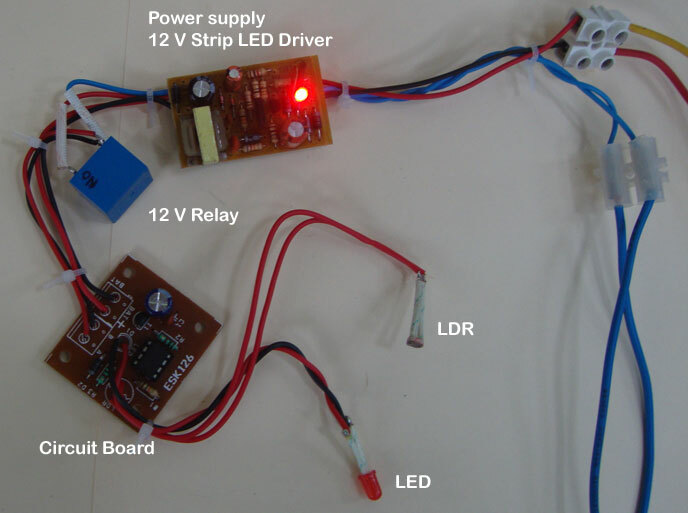 I used a 12 volt Strip LED driver commonly available at the cost of Rs. 100. It is the simple trick of an LDR. Light Dependent Resistor (LDR) is a kind of variable resistor and its resistance varies according to the intensity of light. In dark, LDR offers very high resistance around 10 Meg while in bright light; its resistance reduces to 100 Ohms or less. 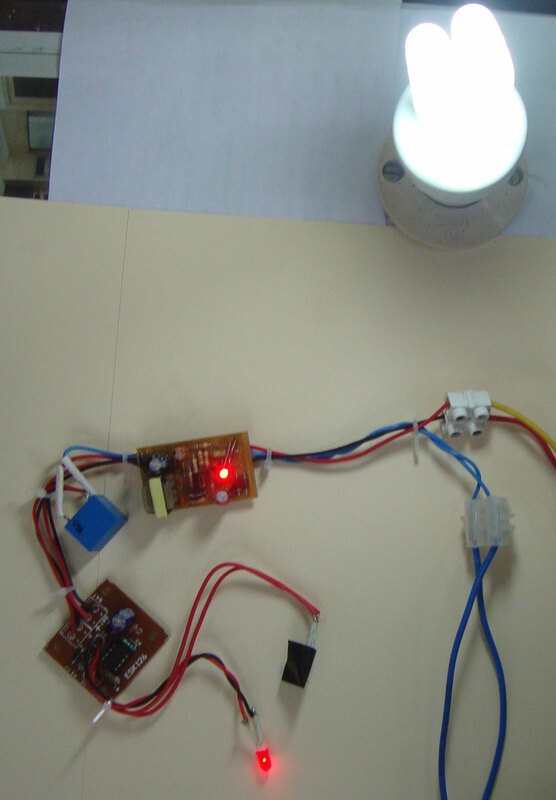 So the low cost (Rs.4) 5 mm LDR is an ideal choice as light sensor. For automatic switching, a Bistable using IC 555 is used. Its Threshold pin 6 and Trigger pin 2 are tied together and connected at the junction of LDR and 10 K resistor ( R1). So during day time, LDR conducts and takes the pins 6 and 2 of IC1 to a high level. This keeps the output pin 3 of IC1 low. As a result, T1 and Relay will be off. The lamp’s Phase line is connected through the Common and NO (Normally Open) contacts of the relay. So when the Relay is off during day time, the NO contact will be open and breaks the power to the lamp. When the sunlight reduces in the evening, resistance of LDR increases. As a result, pin 6 and 2 of IC1 turns low. Suddenly, the output of IC1 turns high and triggers the Transistor (T1) and the Relay. Relay contacts join and lamp gets power and it turns on. This condition remains as such till morning. When sunlight again falls on LDR, lamp turns off. Red LED indicates that the Relay is on. Capacitor C2 eliminates the Relay chattering during the transition of light to dark and vice versa. Capacitor C2 maintains a steady voltage at the base of T1 so it will switch only when sufficient voltage is available .Diode. D2 removes back e.m.f during relay switch off and protects T1 from damage. You can assemble the circuit on a small piece of common PCB. Use an adapter box with pins for housing the circuit so that it is easy to plug in. Drill two holes for LDR and LED in the case. LDR should get day light (not direct sunlight), so the unit should be fixed outdoor. Porch is an ideal place. Light from the lamp should not fall on LDR at night so orient the LDR’s position accordingly. In the place of the Relay a Triac can be used. But it has the following draw backs. 1. Triac conducts from Main terminals 1 and 2 , so the lamp should be connected in series – Phase – Lamp – Triac – Neutral. So only Bulb can be connected. 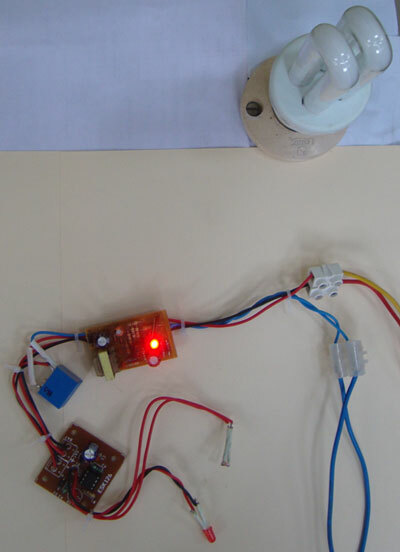 CFL works in series connection, but its internal circuit will damage easily. 2. Triac needs correct Firing angle to give full brightness for the bulb. During the transition of light on LDR, Triac suffers Black lash effect so bulb will dim during light transition period and becomes bright only in full darkness. Bulb will also flicker during the light transition. To eliminate the back lash effect, we have to add a Snubber network along with Triac. The dimming, flickering etc will permanently damage the CFL if connected. 3. The relay eliminates all these problems because it works like a switch in the phase line only. So any type of lights can be connected.